Nurture is packed with all the core features required to create a robust marketing engine for your business with an ability to automate it to create personalized conversations with prospects to engage & convert them into long term customers. Nurture's on-site engagement feature helps you to turn website visitors into subscriber on social platforms. Instantly reach real-time website visitors to survey them for critical market insight and user feedback. Nurture's tag-based segmentation delivers a truly natural marketing database segmentation that just works. You can A/B test your email templates and subject lines like never before with Nurture's dead-easy functionality. Trigger rule-based messages to customers and prospects leading to a very personalized experience. Add human touch to your marketing with real time alerts for sales team to act and connect with engaged prospects. Nurture can be configured to send real-time alerts based on website or email activity of engaged prospects. 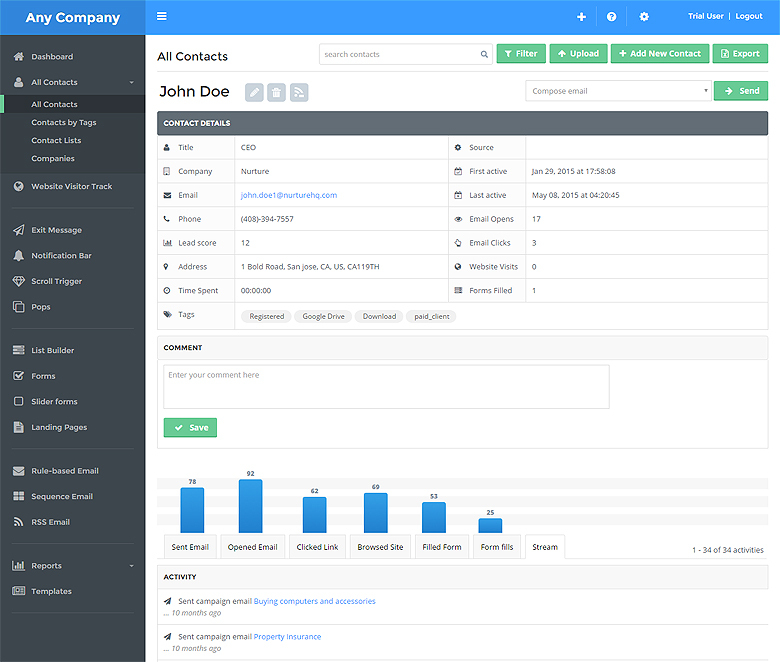 Nurture tracks all granular actions of prospects and customers and creates a comprehensive engagement profile. Metrics are tracked and reported all over Nurture as you go from campaigns to templates to contact profiles. 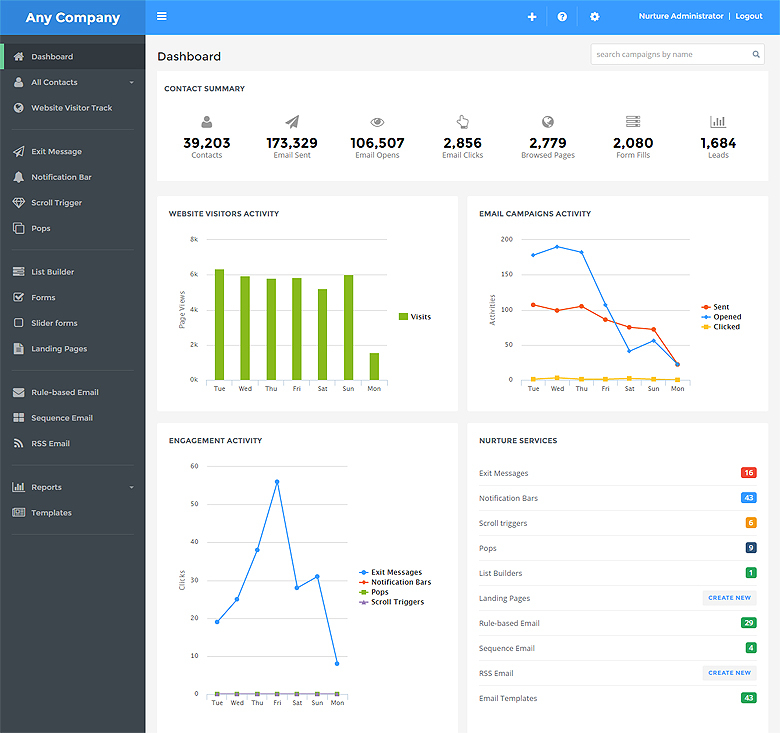 Get a birds eye view of your marketing with a dashboard that includes detailed lead status, full campaign performance metrics and a real time activity stream. Nurture tracks all aspects of a contact & delivers a detailed profile from the time the contact entered your lead management system to right now include all activity details, contextual tags to show interests & a lot more. The most powerful part of Nurture is a dead-easy campaign creator that allows you to instantly segment your lead database & define what message to send to whom and when. If you can imagine it, you can do it within Nurture - its that powerful and yet easy to use. Keeping your leads updated on the latest becomes super simple with the RSS-to-Email campaigns that take RSS feed update and send a beautifully crafted email to the contacts in your lead database. Nurture keeps track of your lead using state-of-the-art technology so you know who's visiting, who's clicking, who's filling up forms and revisiting to create interest and engagement profiles and drive trigger campaigns. One of Nurture's core differentiator is a simple and natural lead segmentation based on tags which can be manually added or can be updated based on rules so your lead database is always well segmented and in a way that you can relate to it and recall the context with ease. You won't find an easier A/B Testing flow that allows you to A/B test your email subject lines as well as the emails themselves so you can understand which echoes best and prioritize those. Full-blown lead scoring rules allow you to score leads based on a wide range of criterion that is data-based as well as activity-based. Lead scores can also be used within campaign rules. 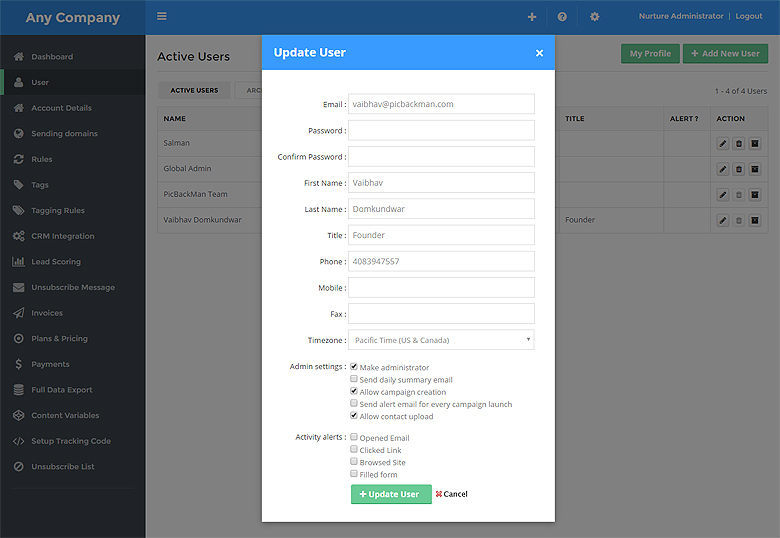 One page user creation and management allows you to create users as well as allocate and manage permissions and setup lead activity alerts that may be most relevant to the particular user. 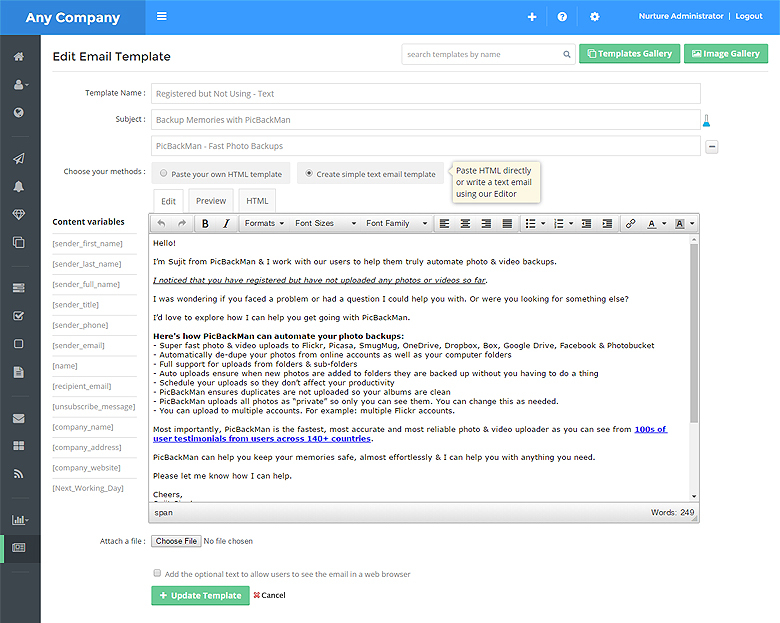 DIY Email Template Creator gives you the full power to create stunning email templates. 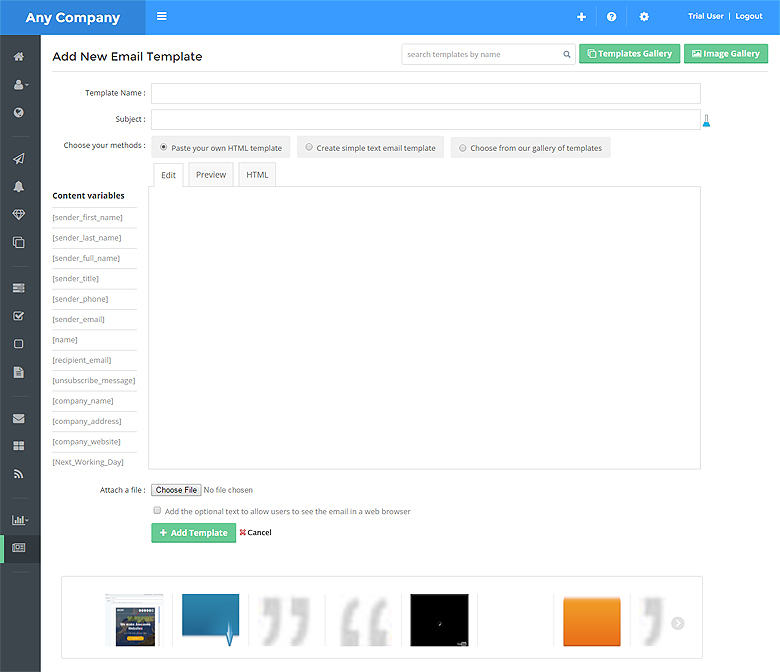 You can create email templates using a WYSIWYG creator or use your own HTML or go the simple text route. 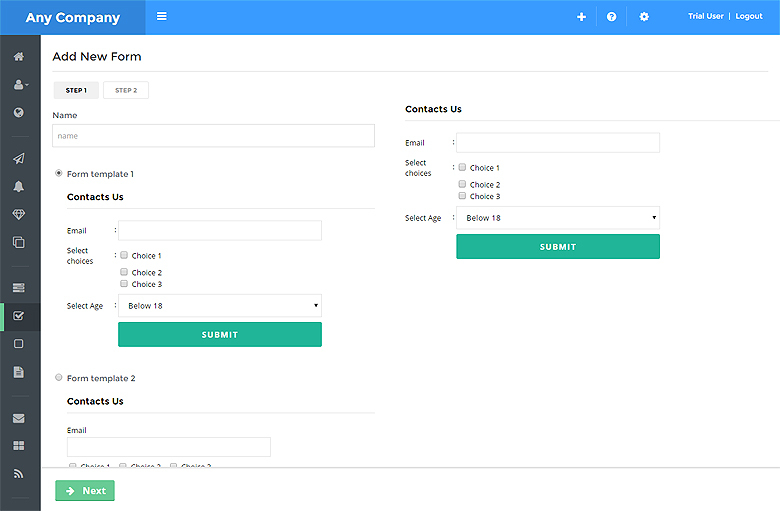 You can create good looking forms with text boxes, dropdowns, check mark boxes, radio buttons and more in a matter of minutes with Nurture's Form Creator. Forms can then be added to you website or microsite as needed. 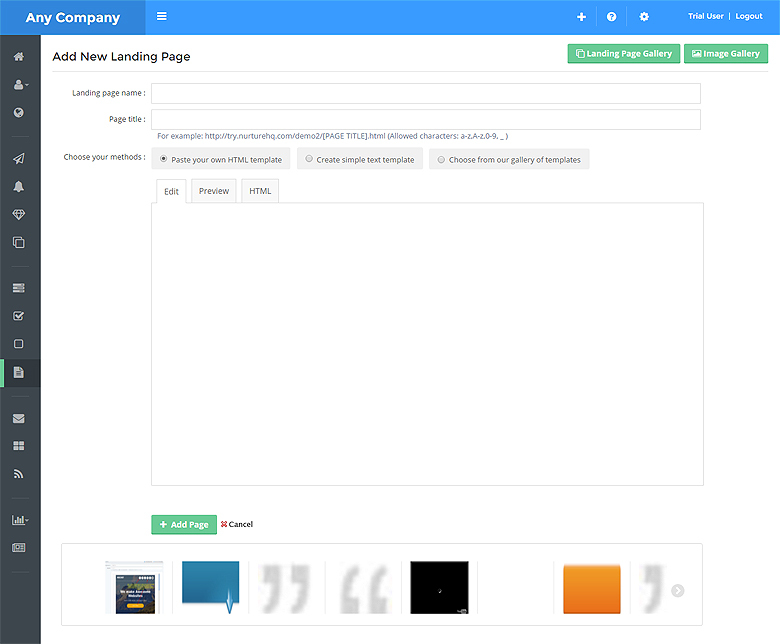 Create and manage personalized landing pages and analyze their performance metrics like visits, clicks and leads. At Nurture, we believe marketing automation is not about driving your prospects and customer through a maze of emails but is a way to build a conversation and must be human and personal. With Nurture you can create a conversation that is a blend of email, direct mail and phone calls that are timed most appropriately to be helpful to your customers. Customers at small and large companies love Nurture for its simplicity, design and effectiveness at "getting things done"! Patrick Hurley, VP of Marketing, Skytide Inc I really appreciate the simple, intuitive design and workflow of Nurture. It's got a nice balance of power and features without the bloat and complexity you find in a lot of marketing automation tools. Marge Bieler CEO, RareAgent Nurture has played an incredibly important role in helping us design personalized demand generation campaigns that have clearly delivered qualified sales leads & produced revenue.